Mayhem can be described as a "state of rowdy disorder." So then, what is MAHEM? When a Manufacturer decides, or is forced into abandoning their creation, there is a void left behind. In these times, people have nowhere to turn for help. Fortunately for us, we have Barthmobile. Our Barth's were left on the alter of the abandoned. With Dave leading the way, we pulled ourselves together and Barthmobile was born. 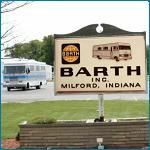 This site was started with the desire to bring together owners of Barth Coaches and to foster a dialog between owners of these coaches. It's not that we make them feel unwanted, it's just that they feel uncomfortable posting about their new purchase on a board that is designed for the Barth Custom Coaches. We have many members on our site who own Some Other Brand... We jokingly call these coaches SOB's. Well, one day, you too might decide to purchase an SOB. Do you post here? Yeah, sure, we hope you'll stick around. We keep telling you you're welcomed here, but the vast majority just disappear. So, in an effort to make you feel welcomed, and with the strong encouragement of a newly minted SOB owner, we have decided to list a new forum on our site. This forum is for members who wish to post about their coaches in a neutral zone. No, this is not a precursor for myself moving into another make. MAHEM stands for the Many Abandoned High End Motorcoaches that are on the same alter we found ourselves on just a little over a decade ago. Pull up a chair, tell us about your coach. It doesn't really need to be an abandoned or orphan coach. There are plenty of other coaches, and their owners, who fit in over here. I am still Barthless but everyone on here has been more than kind. I do feel truely welcomed. I don't know if this motorhome qualifies for all of the definition of MAHEM, but we wanted to contribute it to the list-it's unique. This coach was only produced for three years (1981-83) by Winnebago, giving way to the "Minnie Winnie" we all know. The number ID referenced (621) that it slept 6 and is 21 feet long. It is a steel framed/aluminum skinned RV. Chevy powered (350 4 bolt main/TH400) and the front clip is unique to this coach. It's a rear bath floor plan and very similar to Fleetwood's 23 ft Jamboree in the floor plan. We got a 1982 Winnebago 621 coach back in '012 for $600.00. It's roof had sprung a leak and most of it's interior was gone. But, it ran fine. It is our custom project for next year. When you access it, it will take you to the main page where you select "1982" and "Minnie Winnie". The actual brochure will come up. Both the Minnie Winnie and 621 RVs are combined in this brochure and are easily recognizable from each other. We felt really fortunate to find this rare one and have great plans for it.